Westside Christian College Secondary School provides an environment where students can grow and expand their knowledge, try new things and forge a learning path, which will take them beyond the school and into the world where they can make a valuable and positive contribution. The Secondary curriculum is divided into three – junior secondary, middle secondary and senior secondary. All Years offer flexible and personalised learning, ensuring key concepts and content is taught and able to be built upon in future Years. Junior secondary (Years 7 – 8) follow a set timetable comprising of Core (English, Maths, Science, SOSE, HPE, Chinese, Computer Studies and Biblical Studies). Creative (Music, Media, Drama and Art) and Technology subjects (Cooking, Sewing, Graphics and Technology), are studied in a two year rotation. These two years form the foundation of secondary school allowing students to taste the subjects offered in future years and providing a platform of solid knowledge and skill upon which to build. The Middle secondary school years (Years 9 and 10) allow students to follow their interest for subjects and learning. Students study Core (English, Maths, Science, SOSE, HPE and Biblical Studies) and choose electives from the range offered. It is in these two years that passion develops for senior learning and life beyond school. 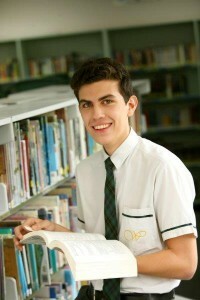 In the Senior Secondary (Years 11 and 12), students study Core (English, Maths A or B and Christian Studies) along with four electives of their choosing. It is in these two years that students develop and in many cases, solidify their learning pathway for the future. Students are also able to select from and participate in a wide range of offerings from TAFE colleges and universities, as well as explore traineeships and apprenticeships. All students in the College participate in the Assessment program of the College – including preparation for NAPLAN and QCS. During your child’s teenage years, the sense of belonging is very important. There are numerous activities, events and functions in which students can participate and belong, where they build relationships with peers and staff. The College has a wide range of sporting teams to join – at a variety of levels. Students are encouraged to have a go, participate, have fun and expand their sporting basis. Cultural activities such as drama productions, instrumental ensembles, debating, public speaking and craft club give students the opportunity to express themselves in different ways. The sense of purpose derived from getting outside yourself and doing something for others is one well-known at Westside. The primary group in the secondary school – Gen Jay – plans and instigates a number of experiences such as those below. Our Helping Hands program, where students prepare meals and distribute these with a smile and caring word to the local Ipswich homeless is now in its fourth year and gaining momentum. This occurs every Tuesday evening and students are humbled by this experience. The annual Cancer Council’s Relay for Life is well-attended and supported by our students – all of whom have had some experience of being touched by Cancer. Various fund-raisers throughout the year for a number of charities allow students the opportunity to dig into their pocket and their heart.